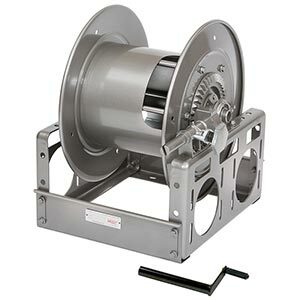 Hannay C Series Manual and Power Rewind Storage Reel to handle 1/2" through 1" O.D. cable. • 4-1/2" x 9" (114.3 mm x 228.6 mm) opening in the drum. • Gear driven crank rewind or chain and sprocket drive powered by electric, compressed air, or hydraulic motor. • Auxiliary crank rewind available on power reels. • Crank rewind reels supplied with pinion brake. • Power rewind standard with comet brake. • Rollers and roller mounting brackets are accessory items; specify roller position. • Divider discs available; specify spacing. • Drum diameters other than standard are available. For storage only. No live connections. 1. Specifications subject to change. 2. Upon request, reels can be supplied with drum lengths other than shown and with disc sizes in other diameters. 3. Weights shown in chart are for crank rewind models. Add 40 lbs. for electric power rewind. 4. 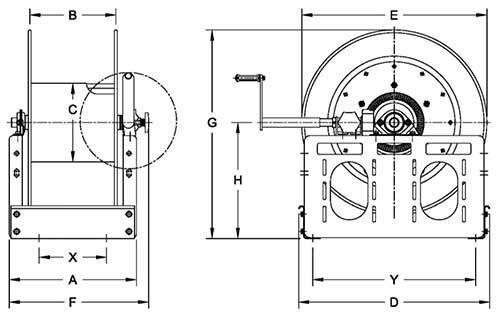 When ordering power rewind models, prefix model number with: A = Air Rewind, EP = Electric Rewind (1/2 hp), HD = Hydraulic Rewind. 5. Air rewind reels are supplied with control valve and 18" air hose; 12v and 24v DC rewind reels are supplied with switch and solenoid; 115v AC rewind reels are not supplied with switch but can be ordered separately; hydraulic rewind reels are not supplied with control valve.